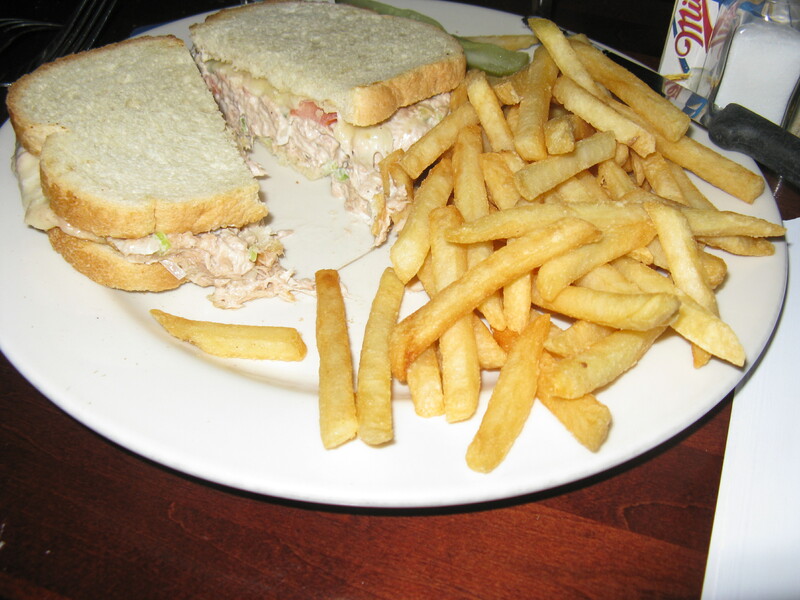 Ahhhh – good old chicken salad, a true comfort food. Whenever I can’t decide what to order for lunch, it is one of my go-to meals. 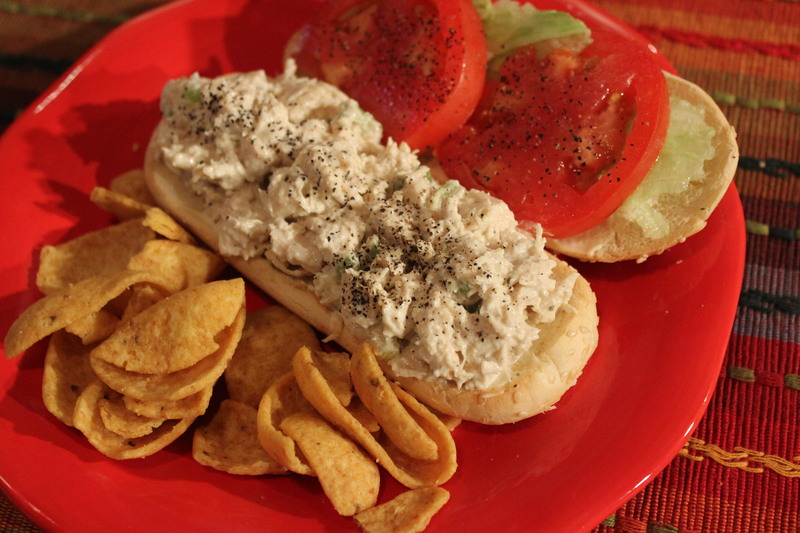 I see chicken salad falling into two categories: chunky and creamy. I love both of them. 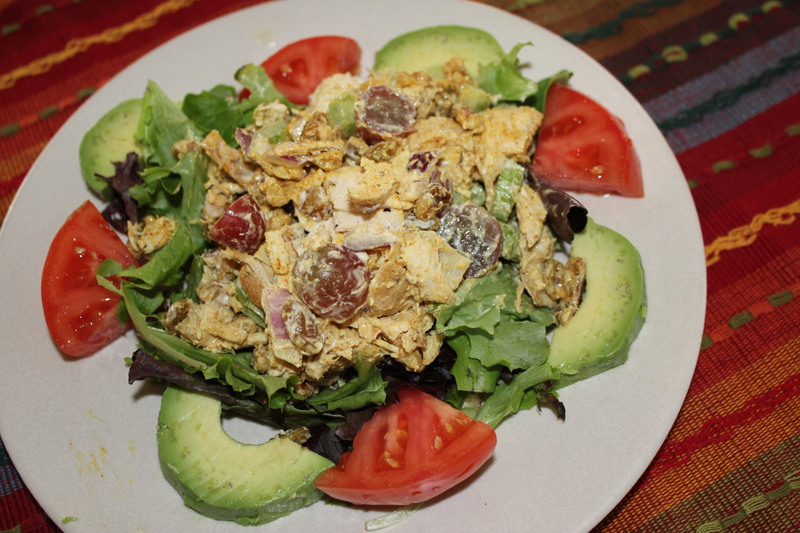 I prefer chunky chicken salad on a bed of fresh salad greens, with crackers or even on its own, although I occasionally will have it on bread. On the other hand, creamy chicken salad belongs on some sort of good, artisan bread or else maybe as a dip for celery and carrot sticks. This entry was posted in Meat and Poultry, Raleigh's Best and tagged Chunky Chicken Salads, eat drink and be merry, Fresh market's Waldorf chicken salad review, kel's cafe of all things food, Kel's curried chicken salad, Kelley Chisholm blog, Neomonde chicken salad review, Raleigh's best chicken salads, Raleigh's best chunky chicken salads, Sunflowers Cafe chicken salad review, Winston's Grille chicken salad review on May 15, 2012 by kelleychisholm. Where’s the Best Brunch in Raleigh? 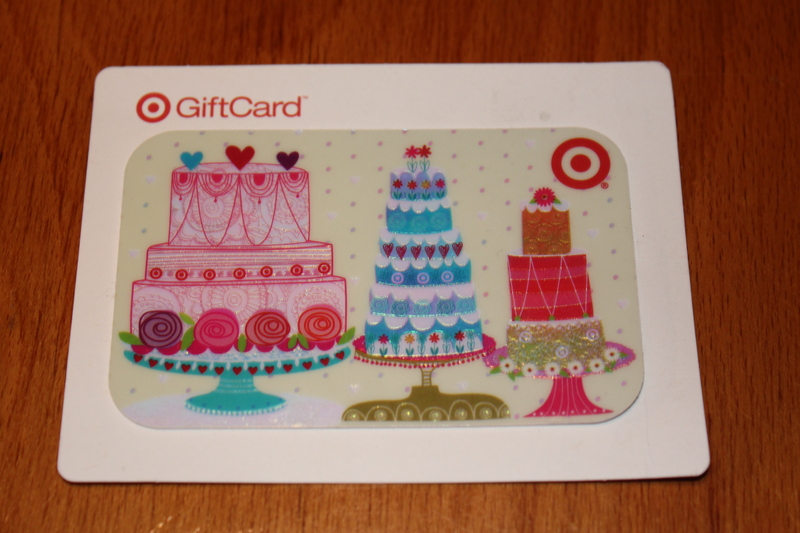 Comment for a Chance to Win a $25.00 Gift Card to Target! I am admittedly not a big breakfast eater, but I do like a good brunch on the weekends. 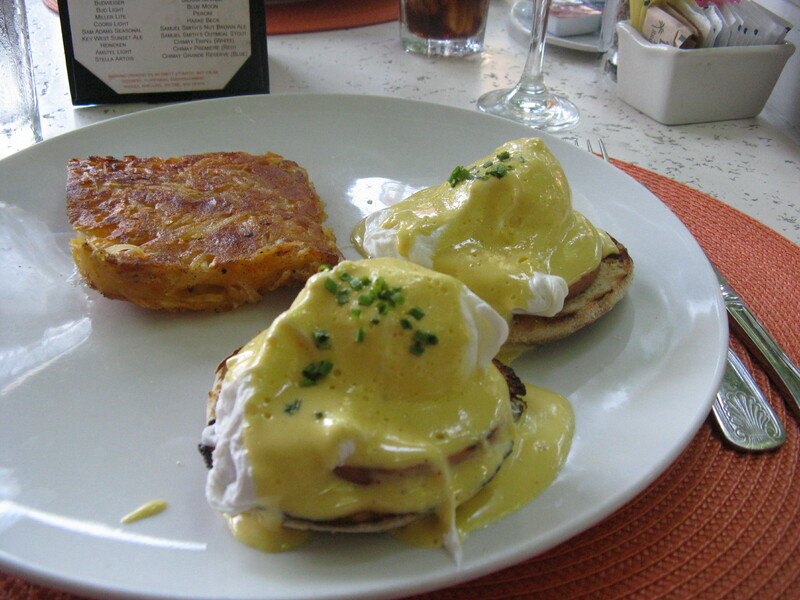 My favorite brunch offerings include Eggs Benedict, corned beef hash or quiche, with hash-brown potatoes and fresh fruit on the side. 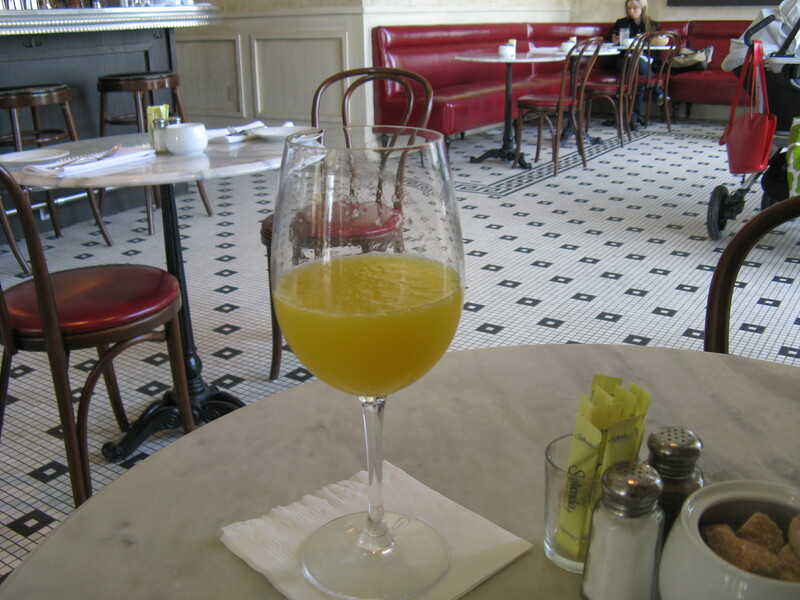 Oh, and don’t forget the mimosas with fresh-squeezed orange juice and decent champagne, or maybe a spicy Bloody Mary instead. The kids love pancakes, French toast or waffles, although Lexi may opt for some link sausages and scrambled eggs. Brad usually goes for an omelet, especially ham and cheese. And all of us love nice, crispy bacon, of course! So keeping all of this in mind, I’d love to hear what your recommendations are for the best brunch in the Raleigh area that is both kid and adult friendly. BTW, I’m not necessarily wed to breakfast food if you can suggest a place that has some unique offerings that I’m not likely to find anywhere else. All of you who respond (by 5/20/12) and suggest a great place to have brunch on the comment section of this post automatically will be included in a drawing to win a $25.00 gift card to Target. So take just a minute and please let me know where I need to conduct my next round of market research! 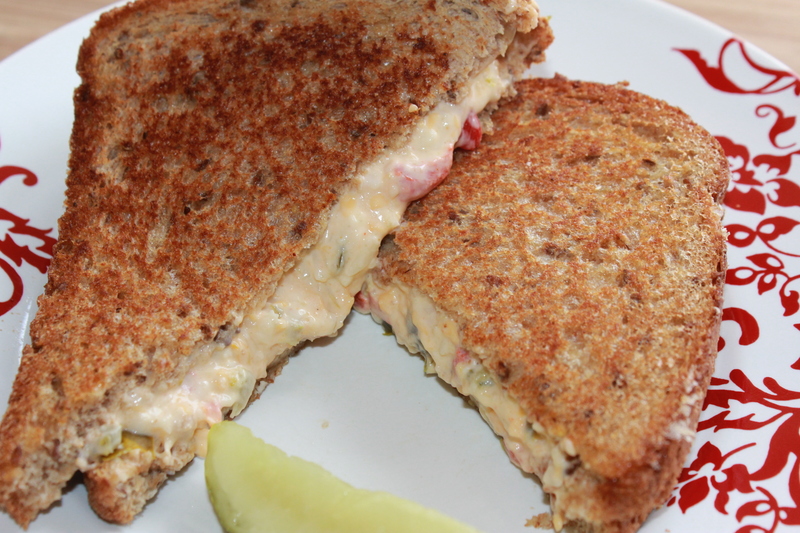 This entry was posted in Raleigh's Best and tagged Best brunch in Raleigh give away, Brunch in Raleigh, eat drink and be merry, Kel's Cafe gift card give away, kel's cafe of all things food, Kelley Chisholm blog, Raleigh's best breakfast, Win a gift card on May 6, 2012 by kelscafe. 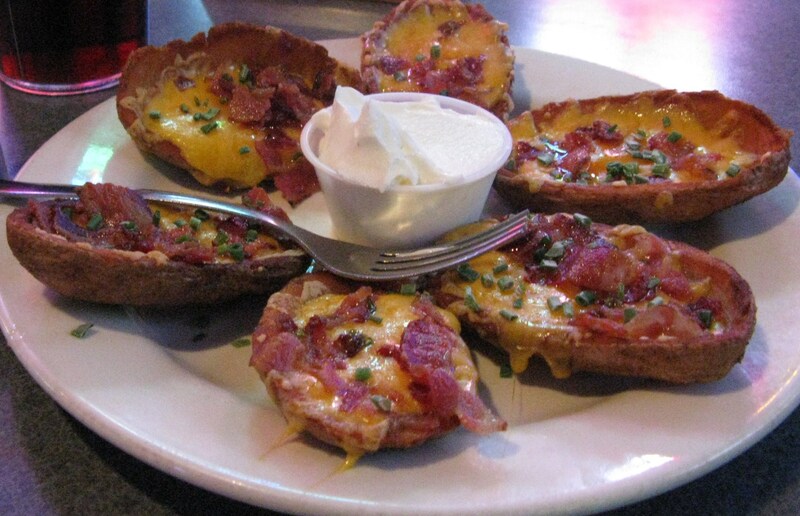 Potato skins are one of my favorite bar foods. Traditional skins are usually filled with bacon and cheese (who can argue with that?) and maybe some green onions or chives, with sour cream on the side. I think the first ones I ever tired were at T.G.I. Fridays in the mid-80s, and I’ve been hooked ever since. 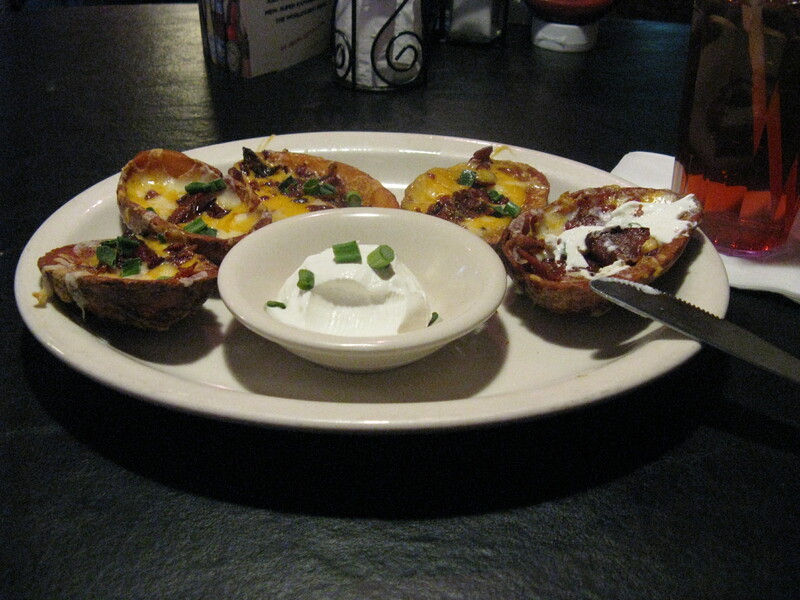 My favorite place to get potato skins in Raleigh used to be Crowley’s on Medlin Drive. I was thrilled when we bought our current house, which is less than two miles away from the restaurant. For me, these were the best skins in Raleigh for a couple of decades running. That is, until recently. The last couple of orders I’ve had have been pitiful – definitely not up to its old gold standard. This makes me so, so sad, but I decided to put on my big girl pants and find a worthy replacement or two. And I’m so glad I did, because I found several. Yum, yum, yum, yum, yum. These skins ($7.99) are so good – lots and lots of crispy bacon and melted cheese with the right amount of potato and still some crunch. Notice the long potato wedges, which I think are great. Love! BTW, if you are a Giants fan, there is a fan club that meets at Duffy’s during the NFL season when the games are not locally televised. 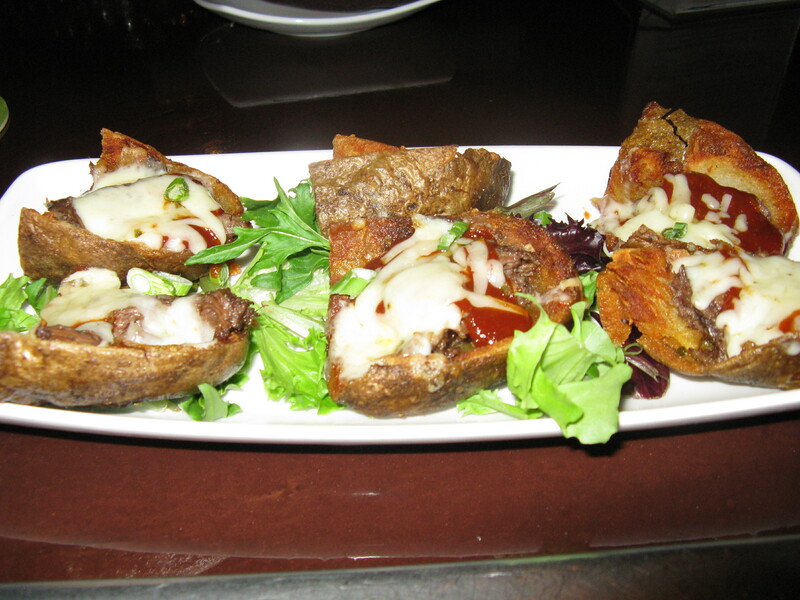 These crispy fried potato skins come filled with BBQ short ribs (yes, short ribs) and Ashe Co. pepperjack cheese ($9.00). Wow. Just wow. I have to admit that I adore beef short ribs, so I was excited to try these skins. They rock! What a great twist on traditional skins. And believe it or not, I didn’t even miss the bacon. Draft hasn’t been open long, but I must say between these skins and its awesome burgers, this is becoming a great place to go watch games. Luckily, Edwards Mill Grill is close to home. These skins ($8.99) are fantastic and come with lots of cheese and a good amount of bacon. 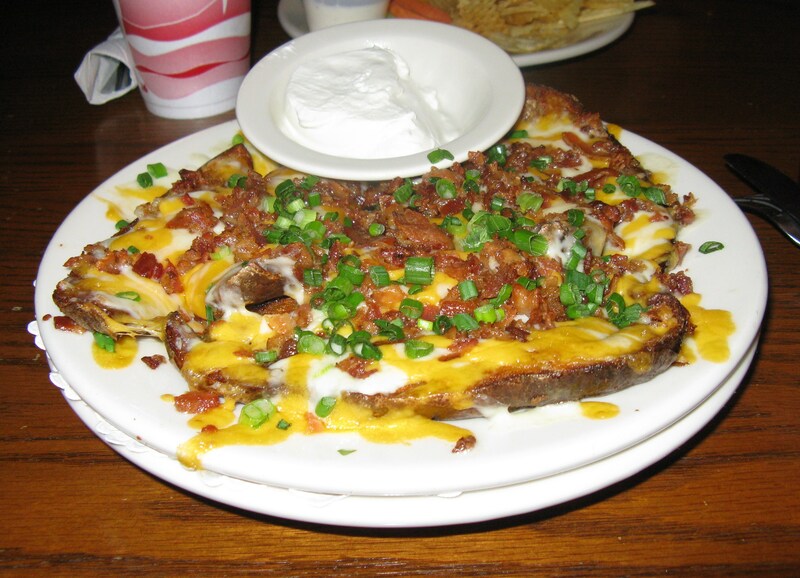 The potatoes are long wedges (like Duffy’s), which I do prefer. These skins are only listed on the restaurant’s dinner menu, but I asked for them at lunch and the chef was more than happy to oblige. There is a great little outside seating area that I took advantage of since it was beautiful outside. Totally recommend! What I love about these skins ($7.50) is that you have the option to add chili to them for $1.00 more. Good choice – the chili made them even heartier. I would have like a bit more bacon, but the chili did make up for that. Good amount of mozzarella and cheddar cheese. 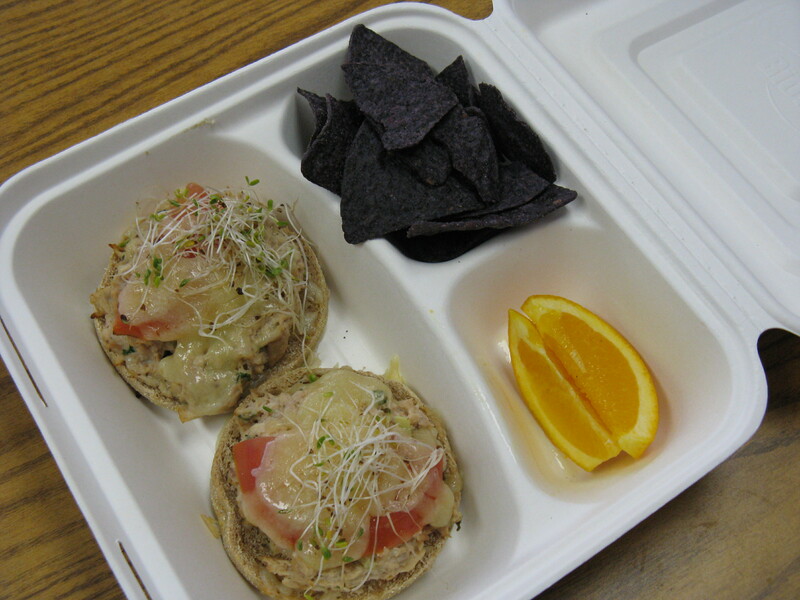 These are a great alternative to my usual Gabby burger order. Sawmill’s skins ($6.49) have been a favorite of mine for years, especially when I used to live closer to the restaurant. 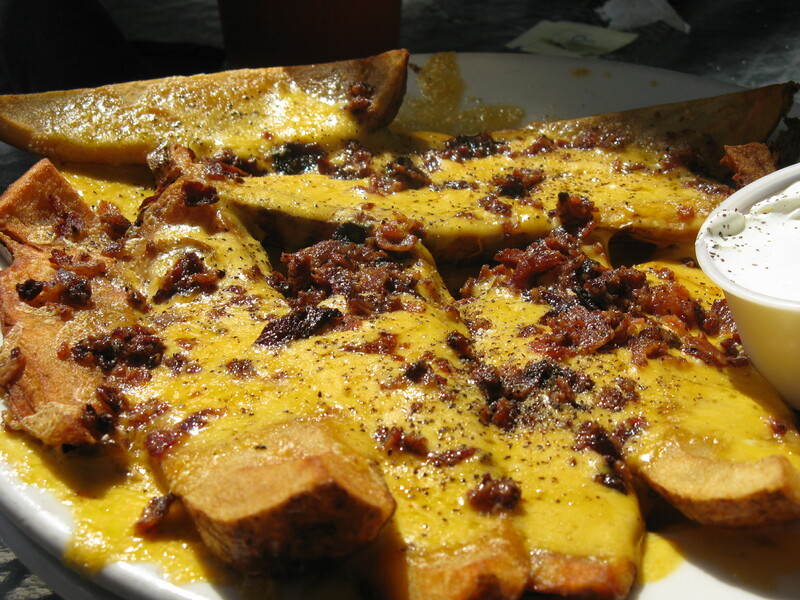 Again, lots and lots of crispy bacon and cheese, and one of my favorite things on the menu. If I’m in the neighborhood, I often stop and get an order to go. 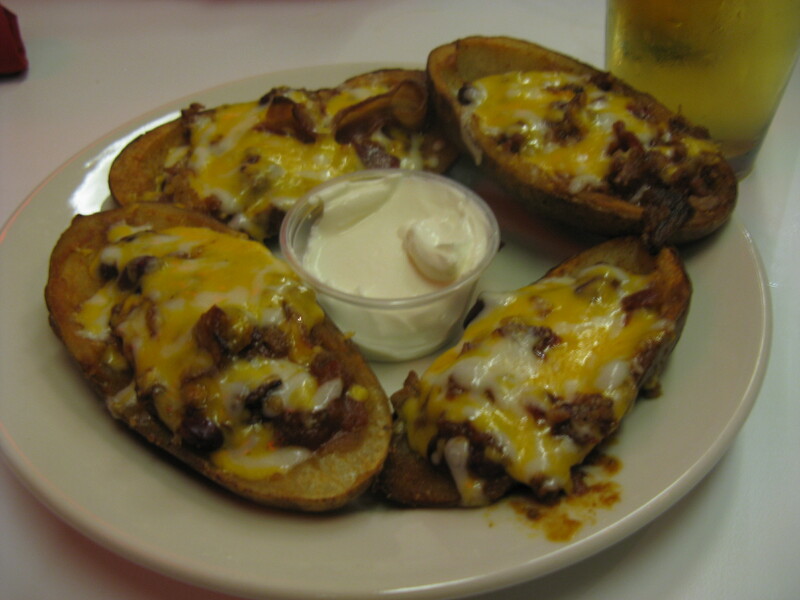 Or, for a different twist, try the New Orleans skins ($7.99) with Andouille sausage and bleu cheese crumbles – also quite tasty! These next places (listed alphabetically) are also quite good and I would not hesitate to order skins at any of them. 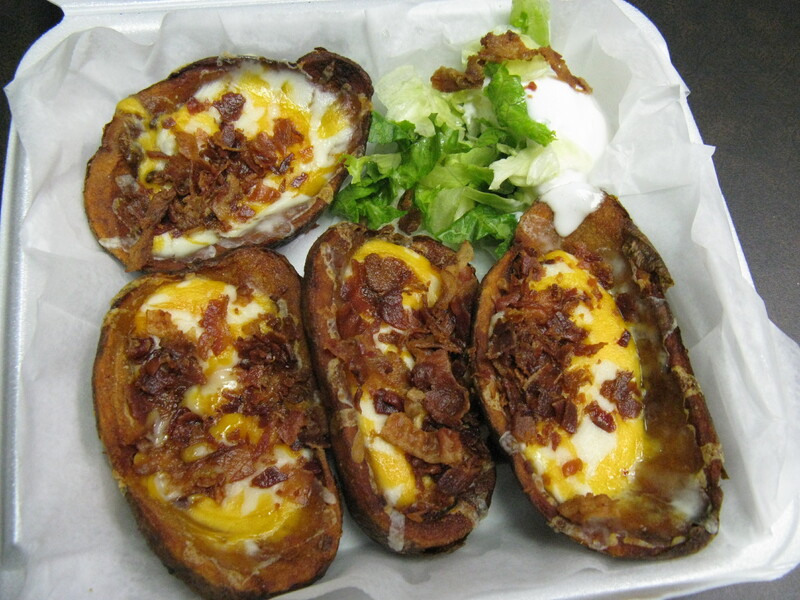 Pair these skins ($6.99) with a Brickhouse spicy Bloody Mary, and you have a winning combination. I wish Brickhouse would upgrade its televisions, but since it is so close to home I can overlook that. They have great outside seating area. Plus I have a soft spot for Brickhouse since this is where I won YMCA’s third annual chili cook off. These skins ($6.99) were nice and hot when I got them. They had an average amount of bacon and plenty of cheese. Quite nice! Also, for an additional $1.50, you can get them with BBQ chicken, which I will definitely try next time. 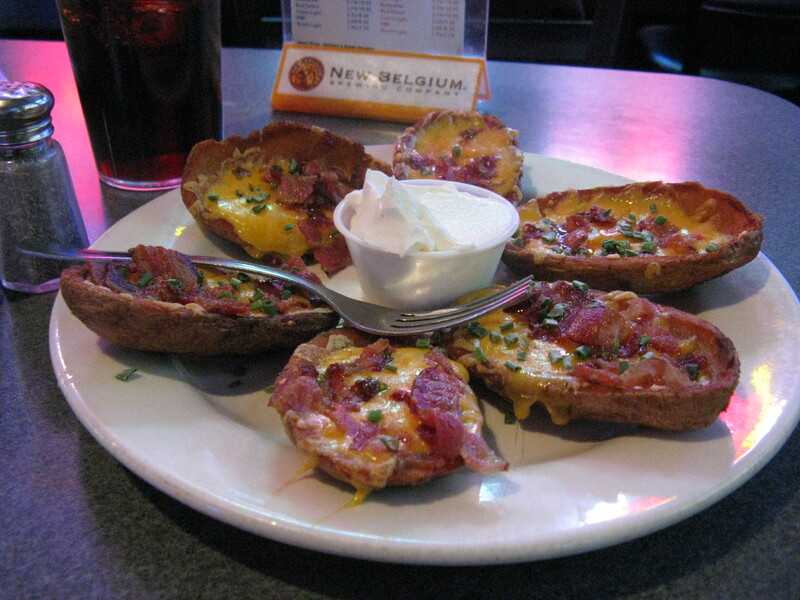 These skins (6 of them for $7.98) were so good – plenty of cheese and, more importantly, plenty of bacon. This is a great sports bar, especially if you are a Wolfpack fan. If it had been around when I was at NCSU as an undergrad, I probably would have been there a lot. I feel compelled to include the skins at Friday’s on my list, because, well let’s face it, they are good. I have to admit that I don’t go to Friday’s that often, but whenever we travel by car I’m more likely to stop there for a meal than at your average fast food chain, especially with the kids in tow. 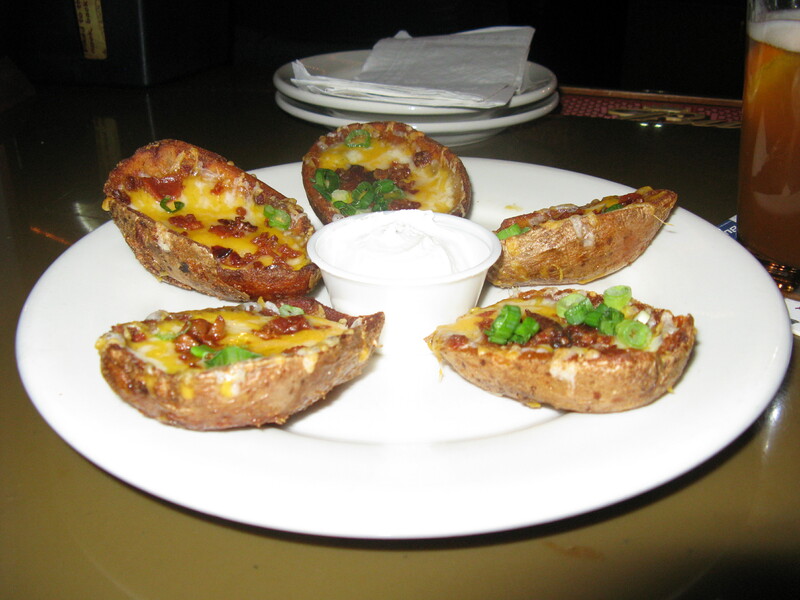 These skins are great, with lots of crispy bacon, cheddar cheese and green onions. 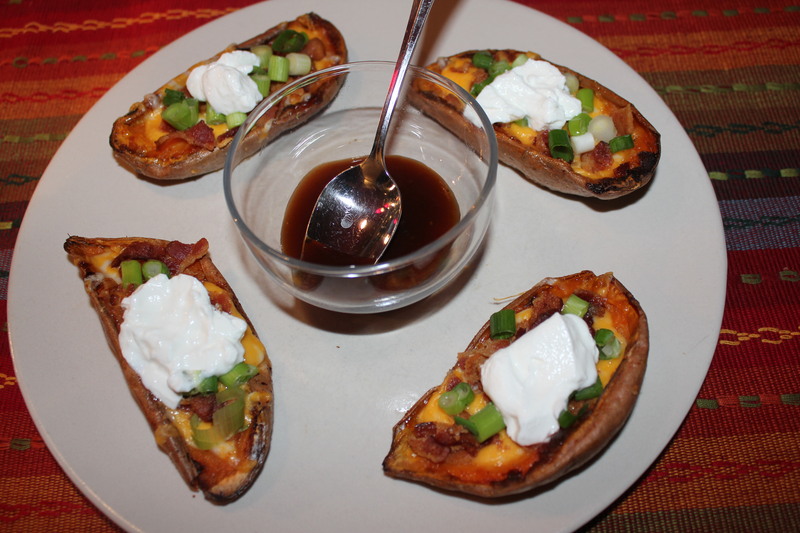 And finally, I don’t mean to toot my own horn (well, yeah, I do), but my savory sweet potato skins are probably my favorite of all. I use sweet potatoes instead of regular ones to make my own skins. 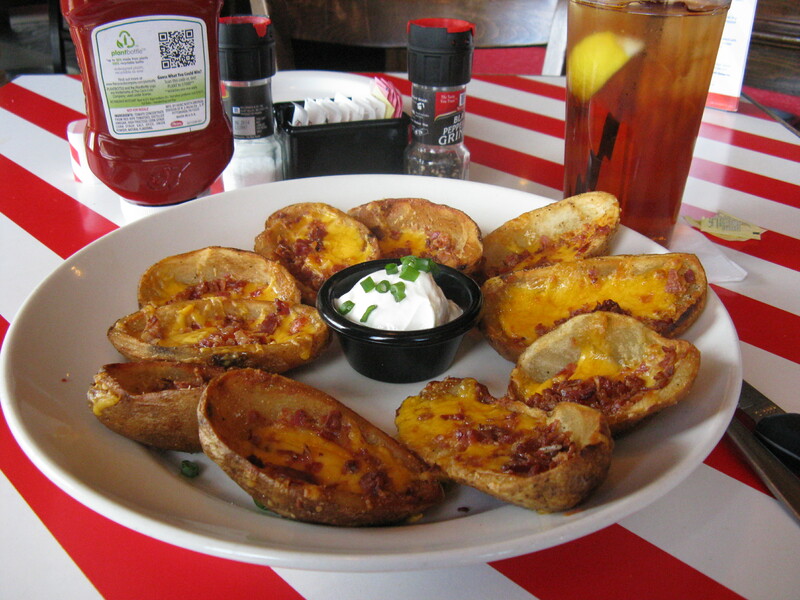 Once you try these, you may never want skins made from regular potatoes again. These are absolutely fabulous and so easy to prepare! Click here for the recipe. This entry was posted in Raleigh's Best, Tools of the Trade on March 29, 2012 by kelscafe. In January I asked my readers where to find the best meatball subs in the Raleigh area (and congratulations again to Lee for winning a $25 gift card to Harris Teeter for responding!) Since then, I’ve been working my way through most of the suggestions (my mouth and tummy have been quite happy – my waistline – not so much.) 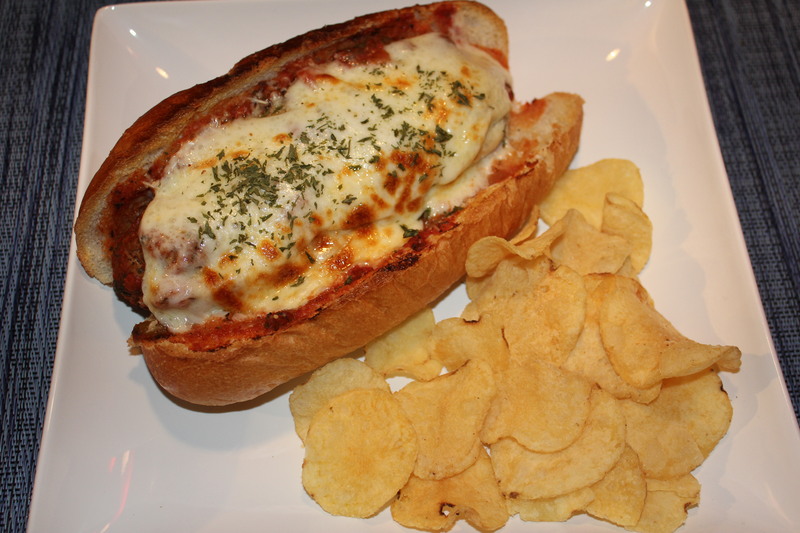 Anyway, when I’m not in the mood to make my own (click here for the recipe for Kel’s spicy, saucy meatballs), I’m happy to visit any of these places for a great, tasty meatball sub. Just remember not to wear white. 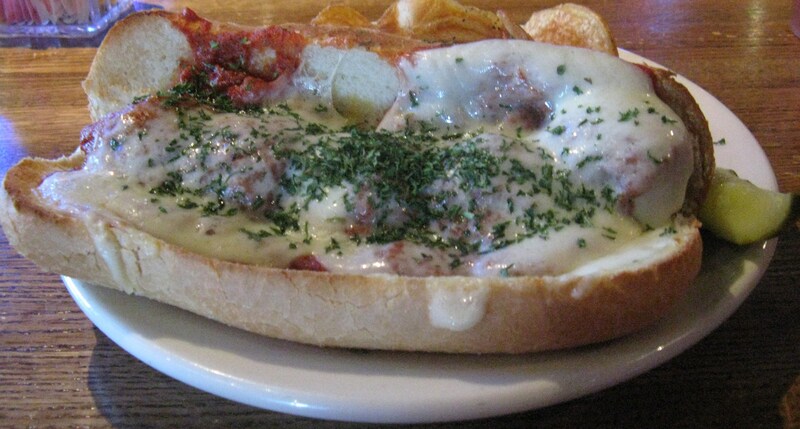 This was my favorite meatball sub, hands down! Messy and delicious doesn’t even begin to describe this sub, which is called the Goomba. The Italian meatballs are a house specialty, and I can see why. 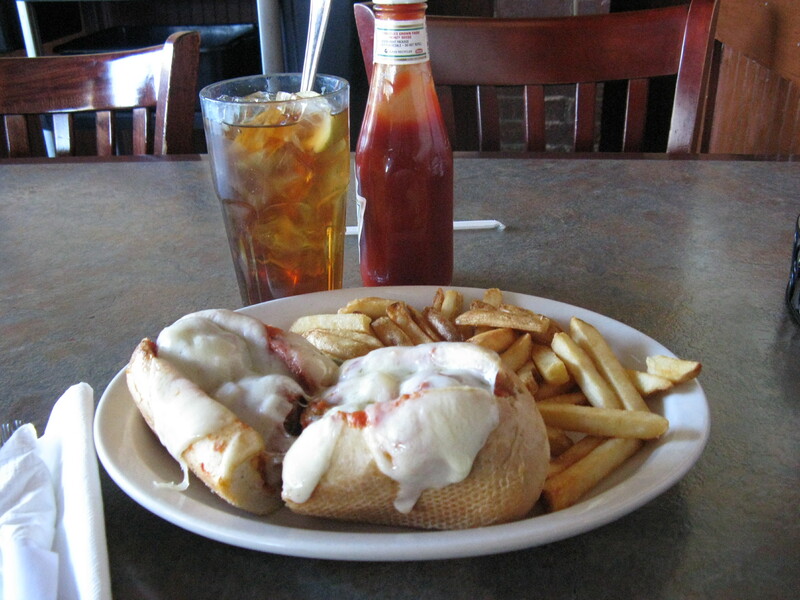 The hoagie roll is a New Orleans French bread that nice and soft on the inside. Lots of tasty mozzarella cheese on top! Well worth $9.99, and it comes with a pickle and a choice of potato salad, slaw or pasta salad. I saw another person eating this and he was using a knife and fork, which I wound up using as well, after my third napkin. 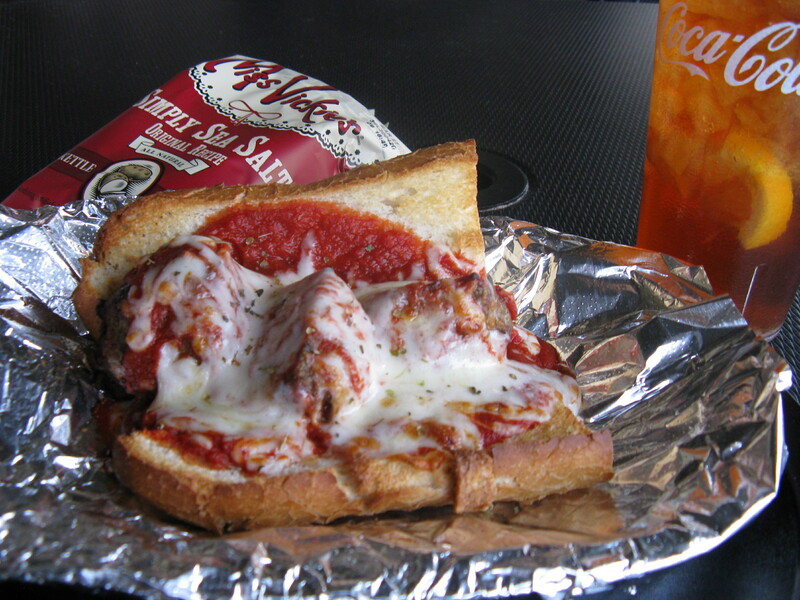 Assaggio’s Italian Bistro and Market (3501 W. Millbrook Road Raleigh, N.C.27613) This meatball sub was excellent. You order at the counter, and then someone brings it to your table. 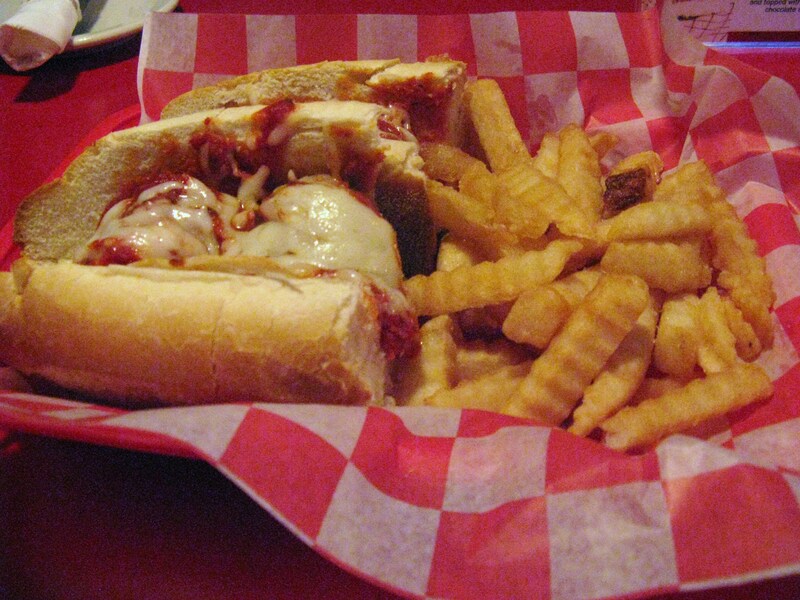 I got the 5” Meatball Parmigiana ($5.95), which came with chips. There were two huge and spicy meatballs on a toasted sub roll. 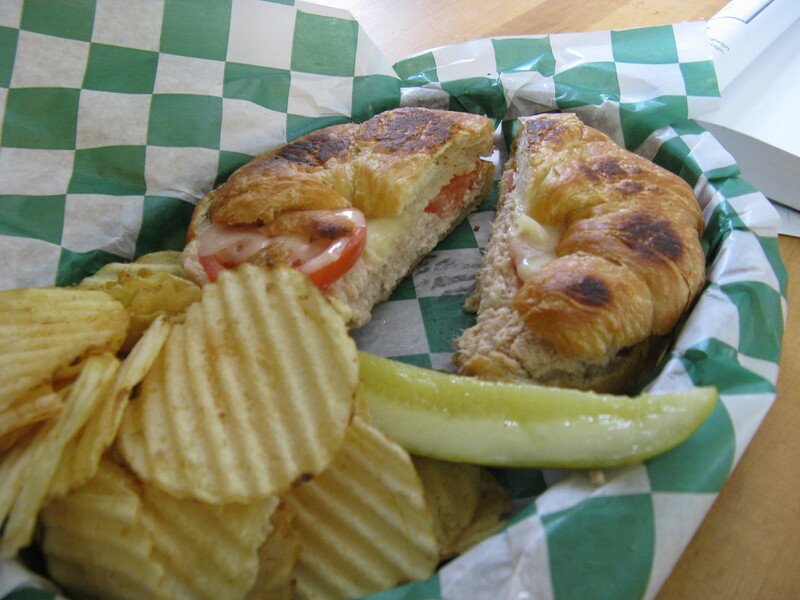 Nice and hot – the marinara sauce is good and just the right amount. Lots of gooey cheese! The service was fast and good. One small drawback for me is that Assaggio’s only serves Pepsi products, but it does have iced tea as well as beer and wine. I can also recommend the Chicken Parmigiana, but that’s another post. I’ll be back! Milton’s Pizza and Pasta (8853 Six Fork Road Raleigh, N.C. 27615) I’ve been going to Milton’s for years. Before I met Brad and was living alone, I would occasionally stop by on my way home from working at Duke and get the lasagna as takeout – good stuff at a reasonable price, and enough leftover for lunch the next day. I can vouch for Milton’s pizzas as well – great crust and fresh ingredients. 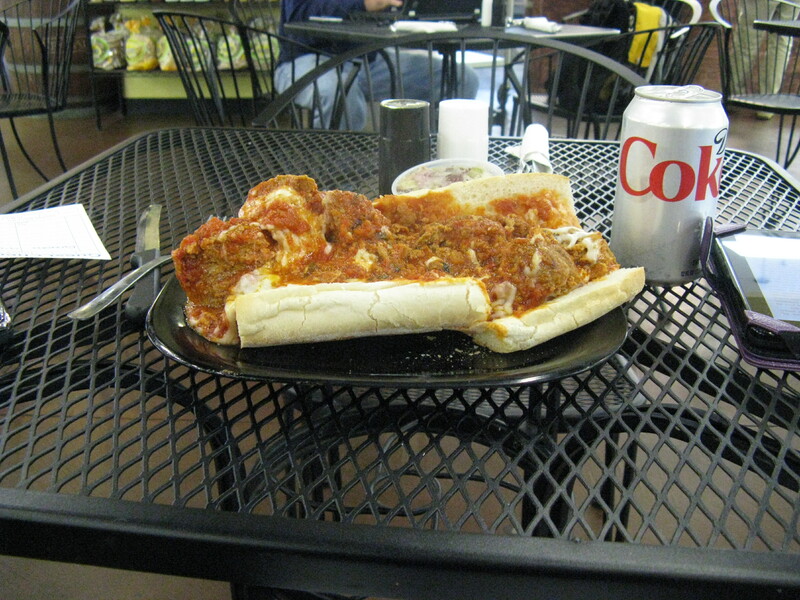 So I knew I had to try the meatball sub (known as the ACC) and I was not disappointed. The meatballs were nice and spicy, and the sauce was good, too – you could tell both were homemade. Lots of provolone cheese as it should be. I could have used a little bit more sauce and it did need some salt. It came with fries and a pickle for $8.49. Milton’s recently added a new bar at the Six Forks location, which looked pretty nice. Mellow Mushroom (601 West Peace St., Raleigh, N.C. 27605) I love Mellow Mushroom’s pizzas as well as a number of its sandwiches, so I knew I had to try the meatball sub. Very good and messy! I got the 5-inch sub ($5.25) on French bread with melted mozzarella. Chips were $1.10 extra – kind of pricy if you ask me. The meatballs were spicy and there was a lot of gooey cheese. The sauce was a little on the sweet side, but still quite good and there was plenty of it. I thought it needed some salt, but that was all. Groovy. Amedeo’s Italian Restaurant (3905 Western Boulevard Raleigh, N.C.) Located across from N.C. State’s campus, Amedeo’s has been a Western Blvd. fixture since 1963. This sub came with big spicy meatballs and good crusty bread. The sauce was tasty and there was lots of it. My server brought extra napkins without asking because he knew I would need them (and I did!) While the sub had a fair amount of cheese, a little more would have been perfect. $8.95 included a choice of fries or chips. Very nice and messy! 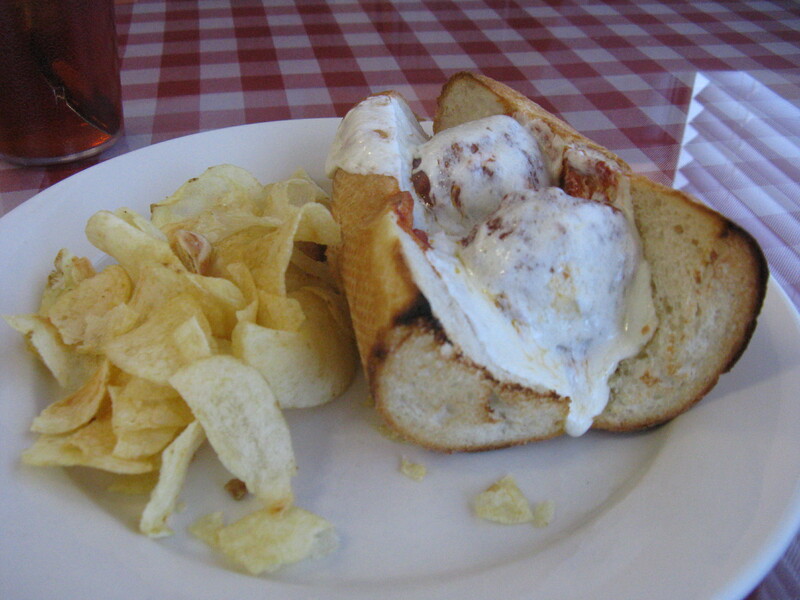 Lynwood Grill (4821 Grove Barton Road Raleigh, NC 27613) This meatball sub was excellent – great bread, right amount of sauce, meatballs were spicy and it had lots of provolone cheese. I needed more than two napkins for this one! 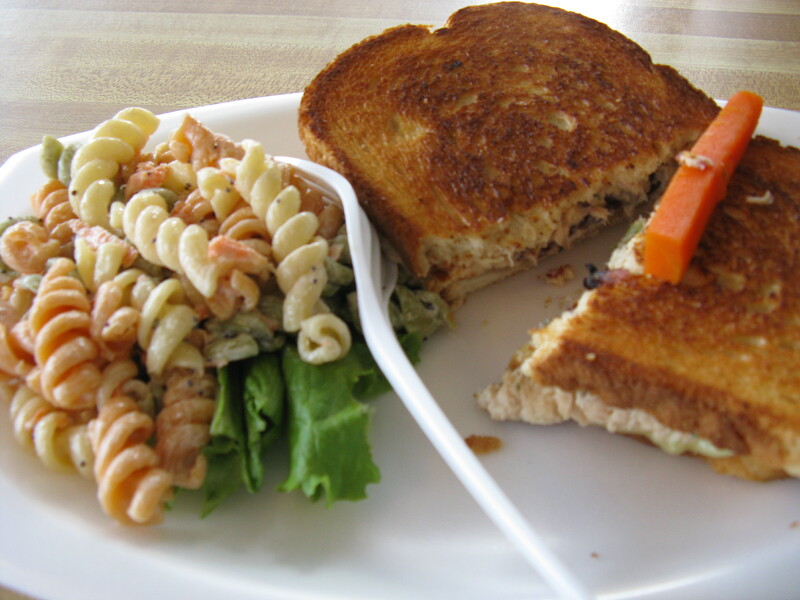 $6.99 included a pickle and choice of fries, chips, roasted potatoes, pasta salad or pickle chips. A great deal! Sub Conscious on Hillsborough Street, Anvil’s Cheesesteaks and Piccolo Italia all had decent meatball subs, but were just not messy enough. I’m sure I could order extra cheese or sauce on the side, though, and they would be fine. This entry was posted in Raleigh's Best, Restaurant Reviews and tagged Amedeo's Italian Restaurant meatball sub, Antonio's Gourmet Market meatball sub, Assaggio's Italian Bistro meatball sub, eat drink and be merry, kel's cafe of all things food, Kel's Spicy Saucy Meatballs, Kelley Chisholm blog, Lynnwood Grill meatball sub, Mellow Mushroom meatball sub, Milton's Pizza and pasta meatball sub, Raleigh's best meatball subs, Restaurant Reviews Raleigh NC on February 28, 2012 by kelscafe. Give me a choice between a cheeseburger and a steak, and the burger will win nine times out of 10. 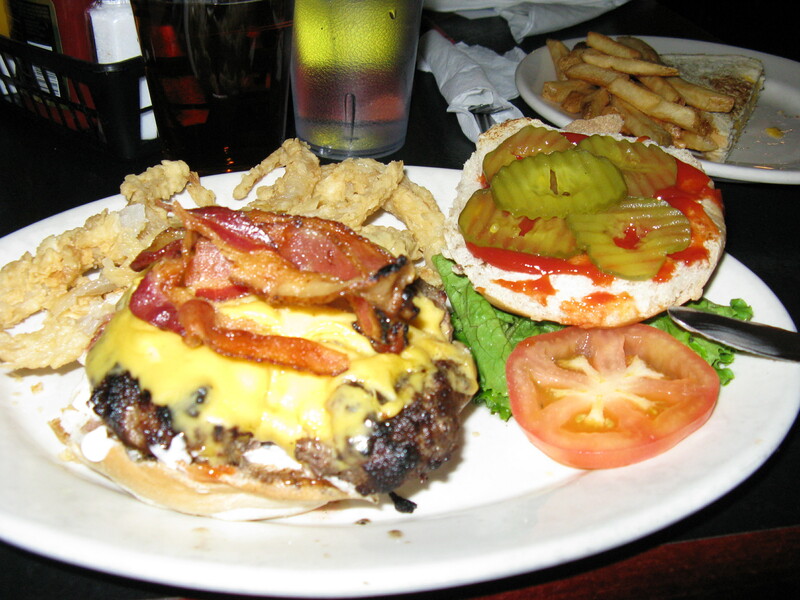 In fact, the burger will usually be triumphant over most meat, with the notable exception of bacon. I love, love, love Gabby burgers and have been enjoying them for more than 25 years. 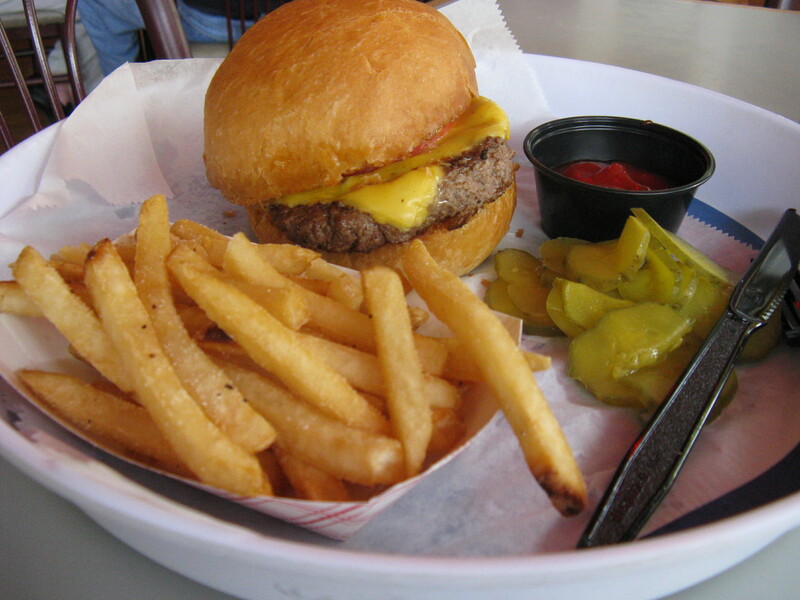 This burger is fabulous and is the least expensive on this list at $6.95. 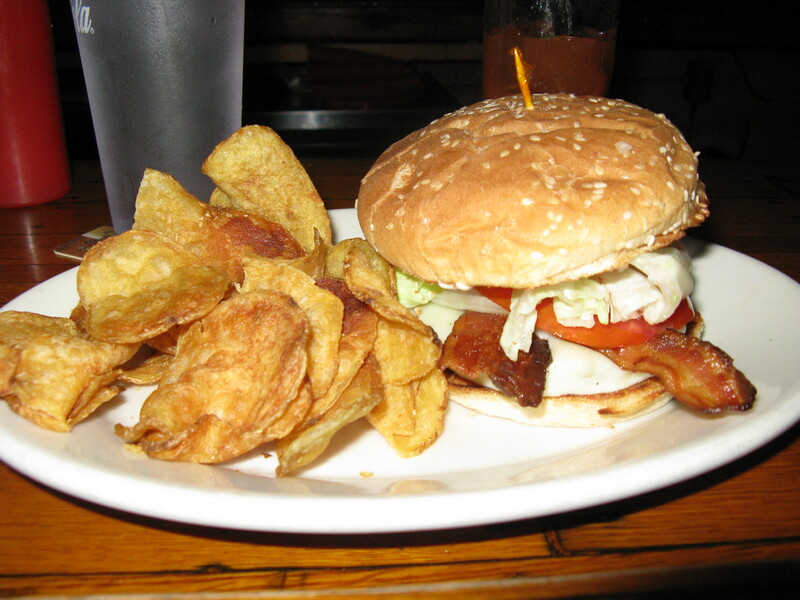 It comes with bacon, provolone, lettuce, tomato, onion and mayonnaise. Click here for a full review of the PR I wrote a while back. The homemade potato chips are the perfect accompaniment. 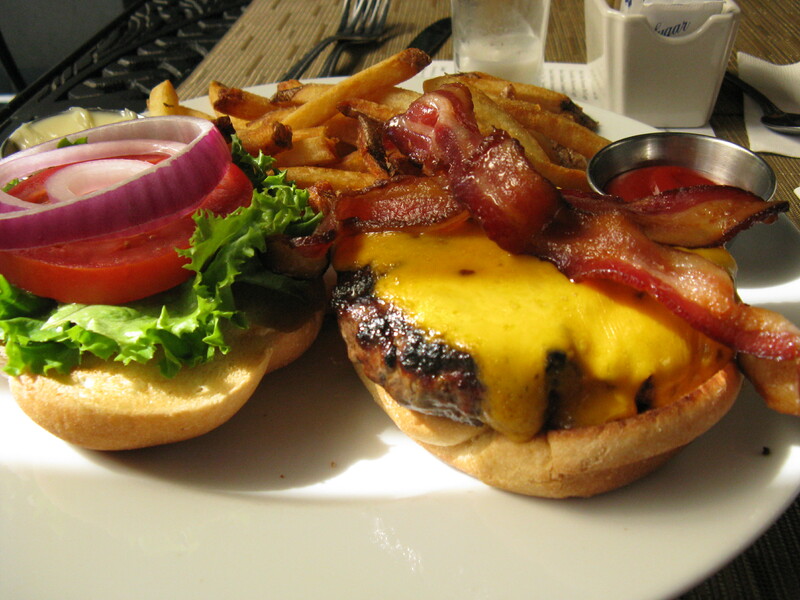 And now you can enjoy this burger in PR’s outdoor seating area – perfect on a nice day. 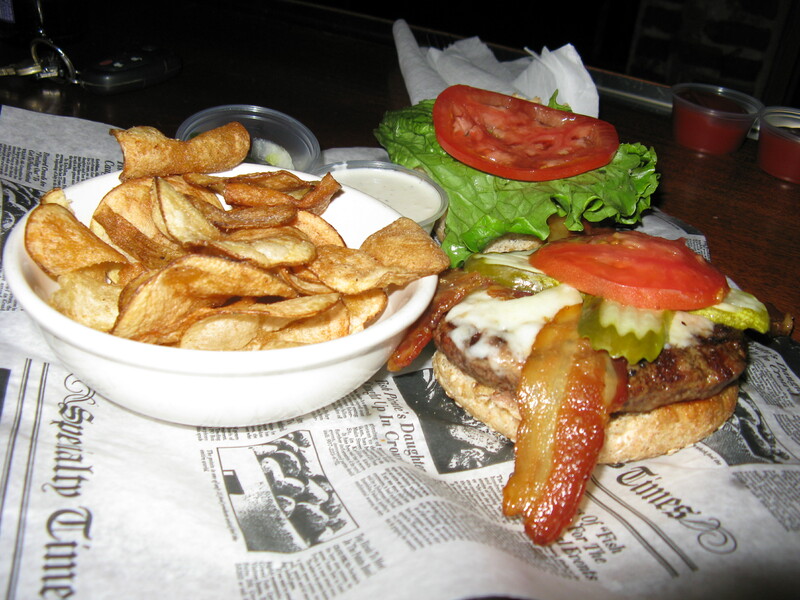 I had the Draft Burger ($10.00) with Ashe Co. cheddar (add $1.00) and bacon (add $1.00). 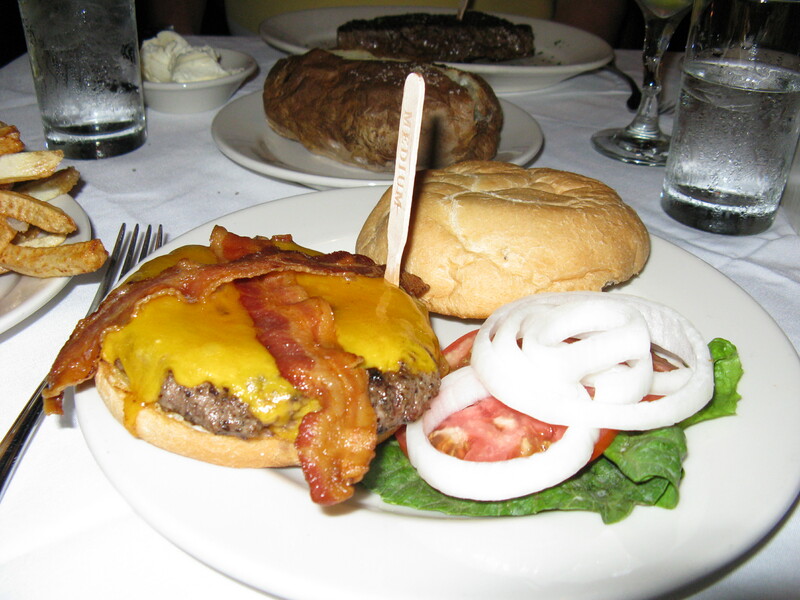 This burger was huge and juicy – it was cooked perfectly. I will be back for more. My one complaint about the restaurant was how loud it was – turn down the televisions a tad and the atmosphere would be much better. **Note: Draft closed it doors on 12/31/12. Mega sigh. Before Porter’s was the Rathskellar, a Hillsborough Street fixture for many years. I was so sad when it closed and I still crave the sweet potato ravioli and mushroom sandwich. However, it only took one visit to Porter’s to appreciate what took the Rat’s place. 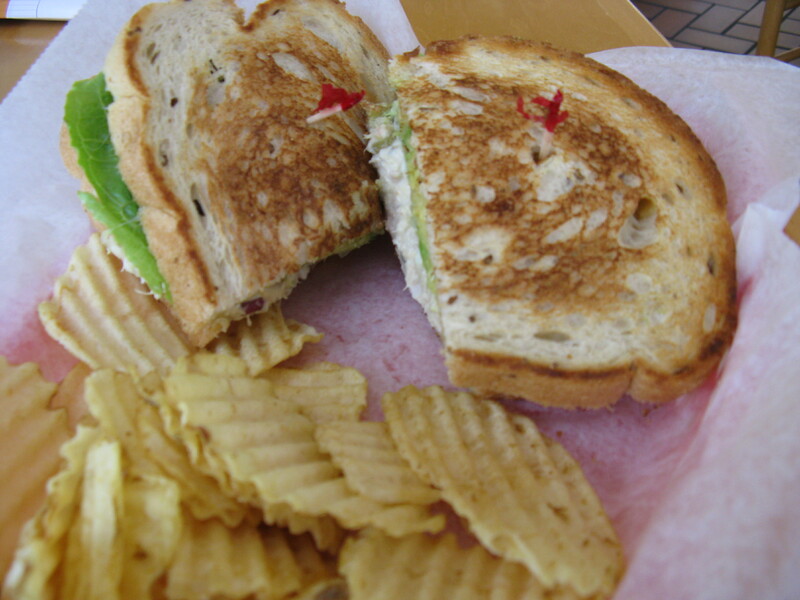 Porter’s menu has seen some changes over the years (no more of its yummy tuna melts – what’s up with that? No more bleu cheese burgers, either and I miss them both.) Luckily, Porter’s still has its Classic Burger, and it rocks! I sat outside to enjoy this tasty treat – Hillsborough St. is a great place for people watching, especially when N.C. State is in session. Service was excellent. 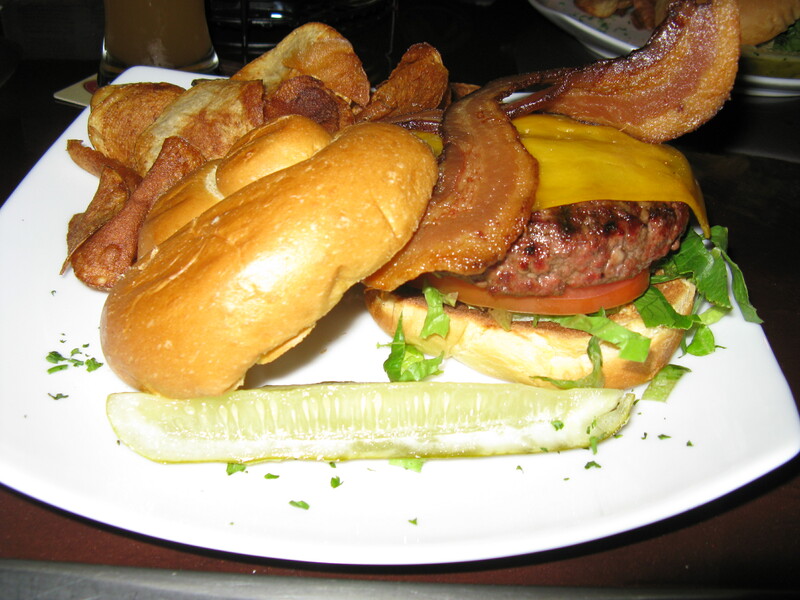 My burger ($7.95) was awesome – 8 oz. of perfectly cooked ground-in-house beef. 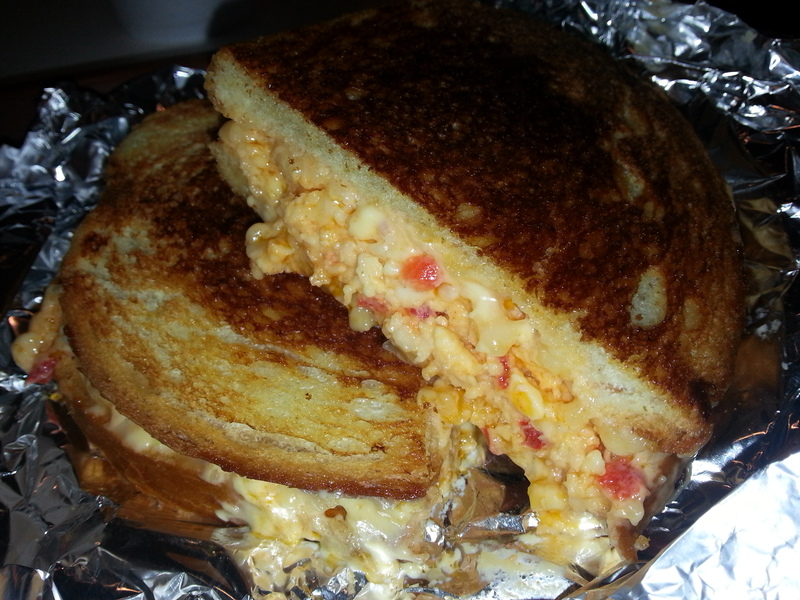 I added cheddar cheese ($.50) and smoked bacon ($.95). Yum! I ordered the George burger, a 10 oz. patty of ground chuck that comes with crispy bacon and American cheese ($8.99). You get a choice of fries, onion rings (excellent!) or pasta salad. These burgers have been voted “Best in Cary” and “Best in the Triangle” and I can see why – mine was seasoned and cooked just right. I can also vouch for the Down South Burger, with chili, cheese, slaw and onions. Definitely worth the drive to Cary. I knew I had to try this burger when Food Network Magazine named it the best in the state (click here for the article: 50 States, 50 Burgers). I can happily report I was not disappointed especially considering The Raleigh Times is one of my favorite bars in Raleigh. This burger rocks! It was cooked to perfection, and I enjoyed each mouthwatering bite. And for $7.95 (add $.95 for cheddar cheese and $1.50 for bacon) it’s a great deal. House cut potato chips are nice for $1.00 extra. If you go to the Raleigh Times and want something a bit lighter, try the guacamole – very nice! 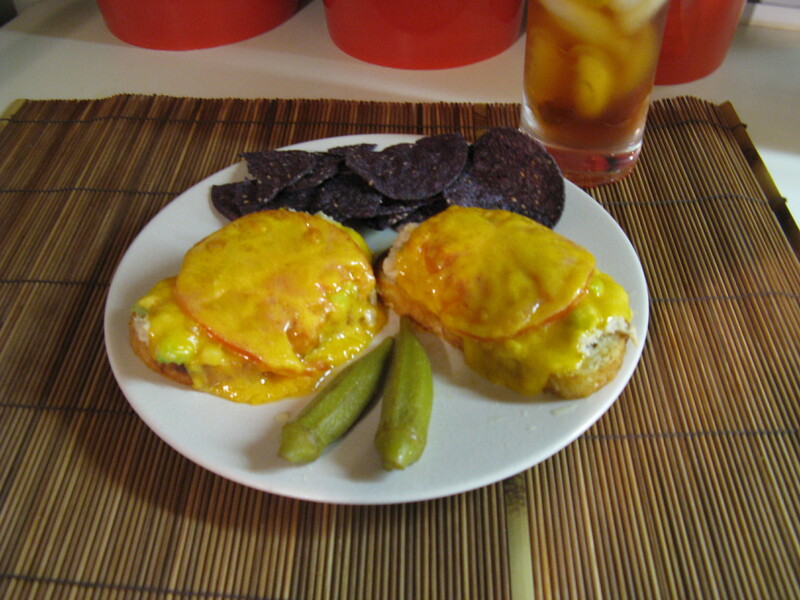 Click here for a short write-up of this wonderful appetizer. Honorable mentions include Vinnie’s Steakhouse, Fat Daddy’s, Tribeca Tavern and Mojoe’s Burger Joint – you really can’t go wrong with the burgers at any of these places. 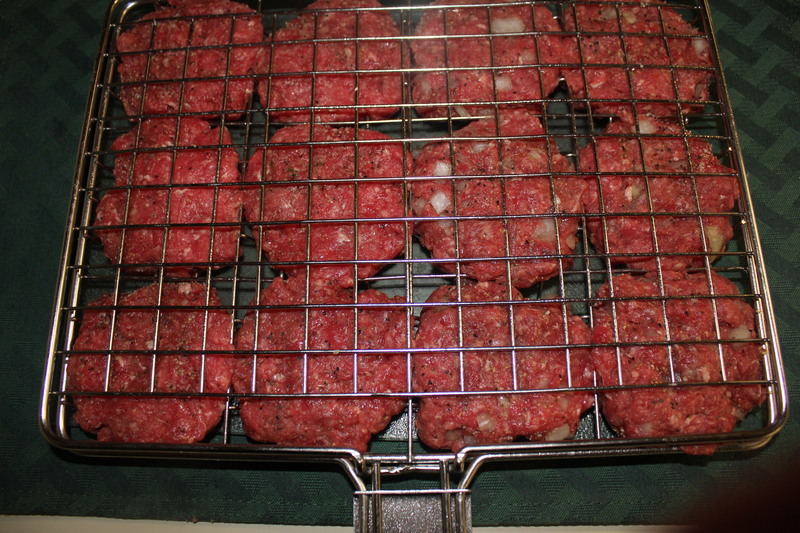 Of course it’s hard to beat a burger that you cook on your own grill, especially pricewise. I bought a great little contraption at Williams and Sonoma to make my own sliders, which the kids (and I ) love. I will be posting my slider recipe soon. I hope to get around to reviewing Durham burgers at some point, but in the meantime please enjoy this great blog – Durhamburger - by fellow burger lover Crystal. This entry was posted in Raleigh's Best and tagged Abbey Road's burgers, Draft Carolina's burgers, eat drink and be merry, kel's cafe of all things food, Kelley Chisholm blog, Players Retreat burgers, Porter's City Tavern burgers, Raleigh NC burger reviews, Raleigh Times burgers, Raleigh's best burgers on January 3, 2012 by kelscafe. This entry was posted in Pescatarian, Raleigh's Best, Restaurant Reviews and tagged eat drink and be merry, food blog, Harmony Cafe tuna melt review, Kel's cafe, Kelley Chisholm blog, North Ridge Pub tuna melt review, pescatarian meals, Raleigh food blog, Seaboard Cafe tuna melt review, Serendipity Gourment Deli tuna melt review, Sunflowers Cafe tuna melt review, tuna fish salad, tuna fish salad recipes, tuna melts, tuna recipes, tuna salad, tuna salad sandwiches on April 19, 2011 by kelscafe.